Okay, it’s been a while since I’ve written one of these bloggy-things, but life has been crazy-busy! You’re dying to know why, right? Well, if I’m wrong, feel free to stop reading. And if I’m right, read on. My 10-year-old son made the traveling baseball team (yay, but holy-moly we are eating, sleeping and breathing baseball). Dance season is wrapping up (which means dress rehearsals, full-filling my volunteer requirements for the Twin Cities Ballet, multiple performances and all the what-not- that goes along with getting my 8-year-old ballerina and hip hop dancer to and from all of the above). Two of my three kids had the throwing up flu (and shared it with me). I found out I need to make a few (sizable) edits on my YA manuscript (by August). I found out that the screenplay my friend and I wrote also needs some edits before the film agent sends it out (that needed to be done yesterday because I was REALLY hoping that project might have been sold already). I’m trying to get a short film done for a film festival this fall (written and filmed). I promised my son we’d film his zombie movie over the summer (and I NEVER break promises to my kids – NEVER). I’m trying to keep things rolling with my Ghost Stories, Inc. group – which means setting up ghost hunts, filming footage for our webseries/documentary and working on a super-cool project I’m not ready to tell you about that our group is creating together (totally top-secret, but seriously awesome and you guys are gonna love it). I was asked to ghostwrite a novel for a spiritual counselor…or psychic…or whatever you call those gifted folks who seem to know stuff they should have no way of knowing. This is kind of awesome because not only do I get paid a pretty sweet advance, but imagine how much I’m gonna learn about psychic stuff by writing a book for a psychic!! That’s like getting paid to do research! The downside is I had it written into the contract that I’ll finish the book in 4 months…which means I’m shooting to have it done by the end of September. Luckily, the woman I’m working with knows my life is crazy-busy and has told me not to rush – although, I’m kind of a freak, and when I have a deadline, I tend to make it happen (which means writing through the night, consuming unhealthy amounts of caffeine and sugar to stay awake and basically attending every practice or game tapping away at my laptop between performances and home runs). I’m pretty sure my three-year-old daughter is nocturnal. I mean, she never sleeps!! And I can’t figure out how to make her keep her cute, little patukis in bed! Luckily, my kids are adorable and I LOVE being a mommy to them more than anything in the whole world, so I can smile through the late night visits from my youngest (who may or may not be a wombat deep-inside her cute little girl body), and almost never find myself having panic attacks when I realize that I need to figure out a way to have them in two places at the same time because they are in WAY too many activities (all of which they love, so I won’t make them give any of them up just because I’m being pulled in 30 different directions). 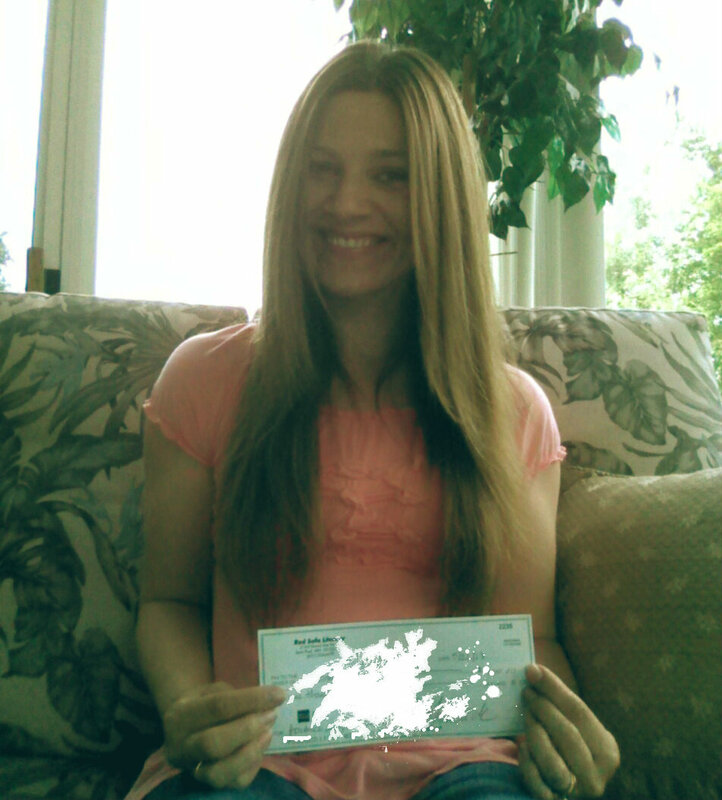 And now, because I like to document my author journey with pictures and share them with you, here’s a little snapshot of me holding my first-ever advance check I got in the mail from my agent yesterday! My Blog Post About a Blog Post! Congrats on the advance! And yes, it is certainly talent to be able to hold a camera with your feet. That takes some mad skills. Add foot photography to my list of stupid-human-tricks! 🙂 Thanks for the congrats! I’m excited, but at the same time feel like I might barf every time I think about being paid so much to write something for someone. Darn gut-retching anxiety! Oh My Lord Jess,I got sick& tired just reading your Blog! I mean it did NOT make me sick, just tired me out:) You really are a SUPER,GREAT, and talented Mommy. An amazing Author also,is there any thing you can’t do? I think you are just a wonderful person inside and out!! Have a GREAT day even if the sun is not shining!!!!!!!!!! Compliments from other SUPER-GREAT mommies always make me feel super-great!! 🙂 Thanks, sweety!! Pingback: Our Next Investigation AND a Contest!! | Ghost Stories, Inc.